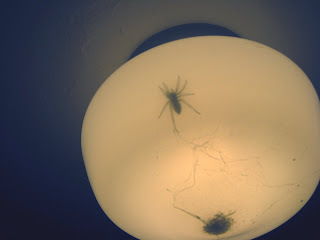 Freddie lives in our kitchen light fixture. Freddie has lived there for over 3 weeks now. We have not a cLue how Freddie got in there, but we know that he cannot get out, and that...and ONLY that is...why he is still alive. No way - I say if he can get in then he can get out and eat your face off in your sleep! IT'S ENORMOUS!